Another short event will be in the Maldives Pavilion in October for a week with Leon Cmielewski and Josephine Starrs. Both are Australian artists whose long term collaboration has produced hybrid media art installations that often use play as a strategy for engaging with the social and political contradictions inherent in contemporary life. Camilla Boemio: Governments reluctantly admit to the existence of a climate crisis – we are in a dysfunctional system – in the decline of western democratic capitalism. What do you think ? Josephine Starrs: The failure of nations to reach an agreement to curb carbon emissions has highlighted the huge gap between the scientific consensus and public perceptions of climate change and its effect on our planet. We respond to climate change in ways that are mythical, biblical and chemical, and we question the urban perception that we exist apart from or outside of nature. Leon Cmielewski: In the visual arts, re-rendering the familiar in new ways is a strategy that encourages audiences to reconsider cultural assumptions. We manipulated NASA satellite images of the Ganges Delta in Bangladesh to embed the words ‘days like these’ into the winding paths of the delta’s multiple tributaries. By changing and animating the seemingly trustworthy satellite imagery, we encouraged viewers to reconsider their assumptions about the environment. How ‘natural’ is nature? How ‘manmade’? CB: How will climate change our life ? JS: The words days like these are from the John Lennon song where he sang ‘nobody told me there’d be days like these’ and I think we are all feeling that with the stress and danger of what could happen to the planet because of global warming. Especially in the Ganges delta where sea levels are rising so much that people are forced to literally pick up their villages and move them elsewhere. LC: Also here in Australia there are big floods happening right now where people are being displaced from their homes. And the other side of the coin is when rivers run dry. The effects of climate change cause massive floods and massive droughts. Scientists have been saying for a while now that weather events will become more extreme and more unpredictable. 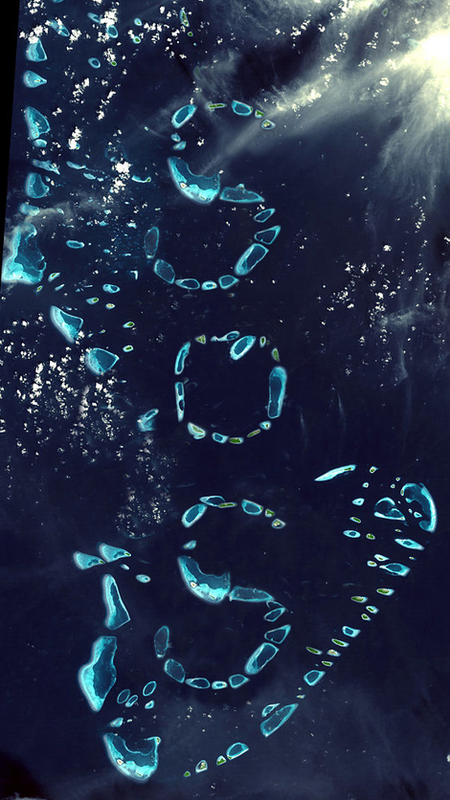 CB: … in Maldives? You tell stories on behalf of future “climate refugees” as part of their ongoing concern with migration stories. JS: Days like these is part of a larger installation, Incompatible Elements, which can be seen as a reference to the omniscient Google world view that we have embraced as we increasingly defer to that oracle in our various networked gadgets. The installation creates an immersive audiovisual environment, that fosters engagement and contemplation about the impact of climate change on landscapes and waterways. 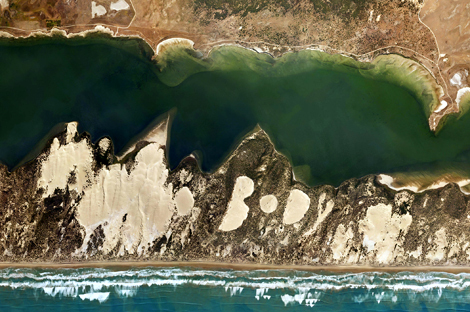 LC: We have embedded and animated the text ‘a living body’ into satellite images of an area in South Australia called the Coorong, a world heritage wetlands at risk from climate change. A living body is how Tom Trevorrow, a Ngarrindjeri elder describes the Coorong. The Ngarrindjeri people are the local aboriginal custodians of that area. They see no difference between the land and the water, perceiving the whole environment as a living body.